The five ducklings hatched at the Zoo June 14. Laysan teals live in the rainforest area of the Aviary in Tropic 6, which is home to four other species: beautiful fruit doves, green-naped pheasant pigeons, Pekin robins and white-eared bulbuls. Laysan teals are a rather small, thin-billed species of duck with a blaze of teal on their wings. Interestingly, the color teal was named after the color found on their wings! While Laysan teals inspired the name of a color, these birds get their name from Laysan Island, the Hawaiian Island they reside on. The mother of the ducklings is 2 years old and came from the San Antonio Zoo. The father is 3 years old and came to the Zoo from the Fresno Chaffee Zoo in California. In the past, about 200 years ago, these ducks resided on all the Hawaiian Islands. Today, they are only found on Laysan Island. During the day Laysan teals hide in dense shrubs and grass. At night they like to reside in the center of Hypersaline Lake, but when raising ducklings, they favor areas closer to freshwater seeps, springs with low flow rates), because the babies cannot handle such high levels of salt. The Laysan teals’ diet consists of aquatic plants, seeds and snails. Since they are not divers or swimmers, they dip their heads into the water to get food. Laysan teals also feed on moth larvae and pupae by filter feeding. They have been observed running through swarms of brine flies trapping the flies in their mouths by extending their necks and opening their mouths. Laysan teals, considered the rarest native water fowl in the United States, are critically endangered. The wild population consists of just 576 Laysan teals; this is due to the single population and the small area they call home. Laysan Island is only 1 ½ miles in size! Conservation efforts are helping to slowly increase the population size. In 2004, Laysan teals were reintroduced to Midway Atoll, an island in the North Pacific Ocean, known as a wildlife refuge for many endangered species. Again in 2014, 28 Laysan teals moved from Midway Atoll to Kure Atoll, which is a mammalian predator-free island 1,350 miles northwest of Honolulu, after a tsunami hit. As of May 2015, 19 ducklings have hatched on the island. 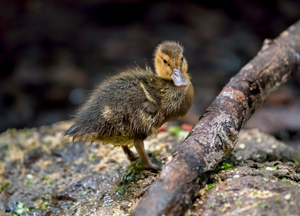 Visit the Aviary today to visit the five new ducklings and learn more about conservation efforts for these very special ducks!